For many gamers my age The Hobbit and Lord of the Rings were our gateway drug to D&D. Of all the tales, the Hobbit is the most "D&D" of them. Instead of a lengthy review I will say I loved it, I want to see it again. Here are some other reviews from other game bloggers. Here are the things that I liked or otherwise stood out for me. In the Rankin-Bass cartoon all the dwarves looked alike. It was difficult to tell who was who and unless you had read the book a dozen or few times like I had names were also forgotten. 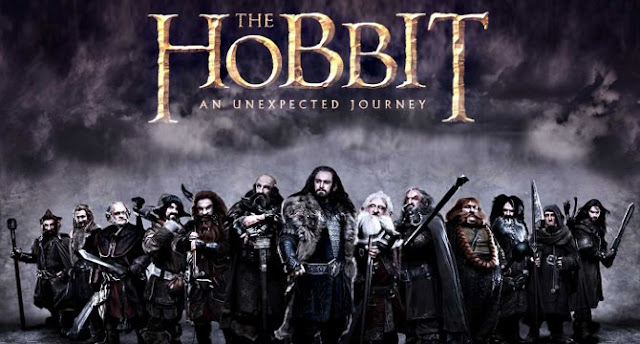 The dwarves in this movie are all individuals. The odd looking styles that everyone seemed to be complaining about worked well on the film. It helped you tell the difference between Kili and Fili, Oin and Gloin and all the rest. No hoods of various colors for these dwarfs, it was, according to my kids, the crazy one with the hammer, the crazy one with the bow or the slingshot. Thorin's Oakenshield. I never thought much about "Oakensheild" to be honest. Back in the day when I first read the Hobbit I assumed it was a family name. Well the "Oakensheild" in the movie was pretty damn cool. Goblins vs. Orcs. I like how there is explicit difference between these two races. We get both in this movie. "That's What Bilbo Baggins Hates!" I would have been disappointed if this had not made it into the movie. Radagast The Brown. Ok, so Sylvester McCoy does come off a little bit like the Doctor in this. But my wife and kids who are Doctor Who fans but have not seen any of McCoy's episodes didn't see that. I do admit that despite all of that I enjoyed seeing on the big screen and enjoyed all the scenes he was in. Riddles in the Dark. Again a great scene. Held all the comedy and menace that the book did. In general I liked the editions since I felt they were true to the spirit of the book. If I want something that 100% true to the book I will read the book. The movie though is it own thing. I am looking forward to owning this on BluRay when it comes out. My sons went and saw it. Me, hubby and daughter are still planning to make it. Just wasn't in the mood this weekend. The "boys" said it was fun but didn't "stick to the book". They liked the additions tho' and said it was well-done. I didn't want any spoilers. I love the dwarves. The hairstyles were a big plus. I loved Radagast. I hadn't seen his Doctor, so I didn't compare. The Azog plotline put a face on their pursuers and tied in the past. This also made the 'Oakenshield' make sense. I remarked that Thorin lost his shield -- "He lost his heirloom!" To me, a serious Tolkien-head, the other changes/additions did not detract from my enjoyment. And it most definitely did not feel padded. I like your point of reading the book if you want the story as exactly set out in the book. The neat thing about the term "Oakenshield" and a lot of the 'new' material featured in Jackson's film is that it is taken from Tolkien's Unfinished Tales. There is a section in there called "The Dwarves of Erebor." It was a chapter cut from the end of Return of the King where Gandalf explainsh his role and reasoning for getting involved with the events of "The Hobbit."